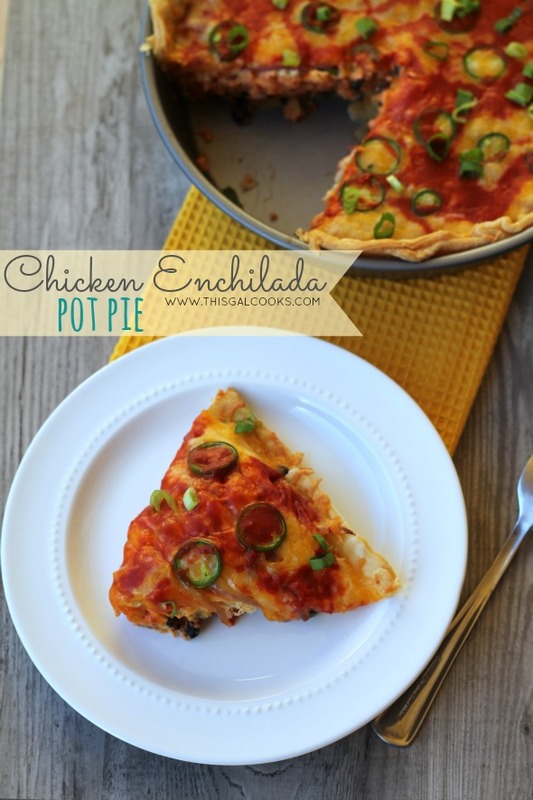 Chicken Enchilada Pot Pie is a simple dinner recipe made with chicken, refrigerated pie crust and all of your favorite enchilada flavors and ingredients! I know what you’re thinking. Pot pies usually have the crust on top of the filling, not the bottom. But this delicious pot pie has the crust on the bottom. You could call it a reverse pot pie. Which is absolutely fine. Why the crust on the bottom? 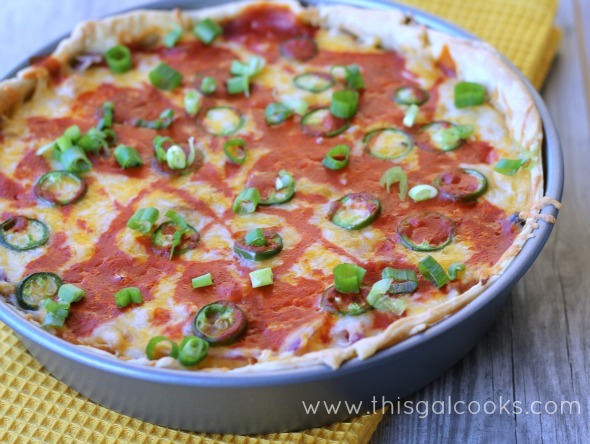 So you can top the pie with cheese and jalapenos! Isn’t it pretty? 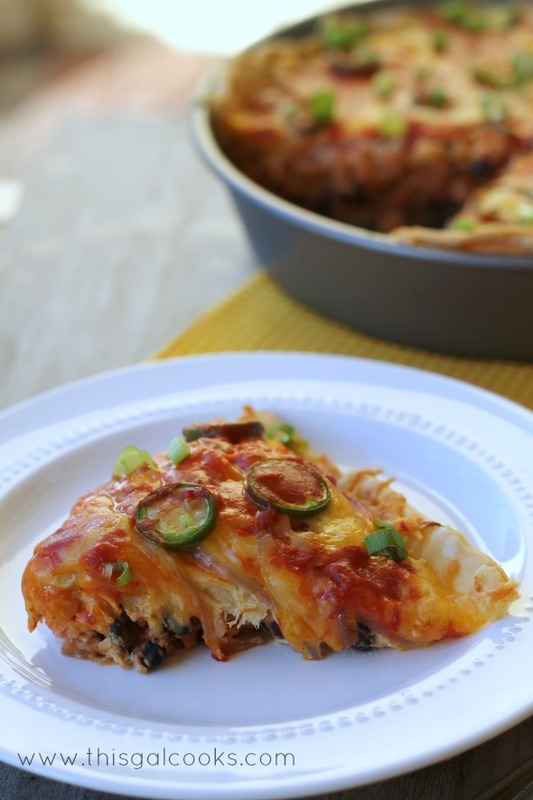 This recipe has it all…well, all that you would typically find in a chicken enchilada meal. Chicken, cheese, enchilada sauce, rice, beans. Ok, it doesn’t come with the corn tortillas but you won’t miss those when you taste how delicious the flavors taste with pie crust. I hope you enjoy this recipe! Roll out the pie crust and place in a 9 inch cake pan. Freeze for 10-15 minutes and then bake at 350 for 10 minutes. Add more pie crust to the sides of the pan if the pie crust shrinks. Combine the chicken, cream of chicken soup and garlic powder. Set aside. In another mixing bowl, combine the rice, beans, sour cream, ½ of the enchilada sauce and the cilantro. Top the rice mixture with the chicken, then sauteed onion, then cheese and sliced jalapeno. Drizzle with the remaining enchilada sauce. Bake at 350 for 25-30 minutes or until the cheese is melted and bubbly. Cool on a wire rack for 10 minutes before serving. Top with sour cream and green onions, if desired. Wow, what a cool combination :) It looks yummy! Julie, you always have such way cool cooking ideas! Love the idea of this in a pot pie…super creative and sounds awesome. Pinning! Have a great evening! This is my kind of pot pie– spicy and tasty! Oh my goodness, this looks awesome!! I definitely want to make this!! I want to go to there. Dang, that looks yummy. Ohhh my. These recipes look absolutely amazing. This looks delicious! I would love to give it a try. YUM!! I love a pie served along side a margarita! This looks awesome! Pinning! Anything with Jalapenos is a dish I need to eat! Julie, this is absolutely calling my name! Pinning! This is such a great idea, looks delicious! Yum!! This looks so good! I can’t wait to try it with the family :) Thanks so much for sharing with us at Weekend Wonder! Hope you’re having a lovely day!